Now you can see what I was talking about in the last note – I took the single zig-zag insertion framed by diamonds as presented in the text, used one column of diamonds as a center “spine” and mirrored another zig-zag on the other side. 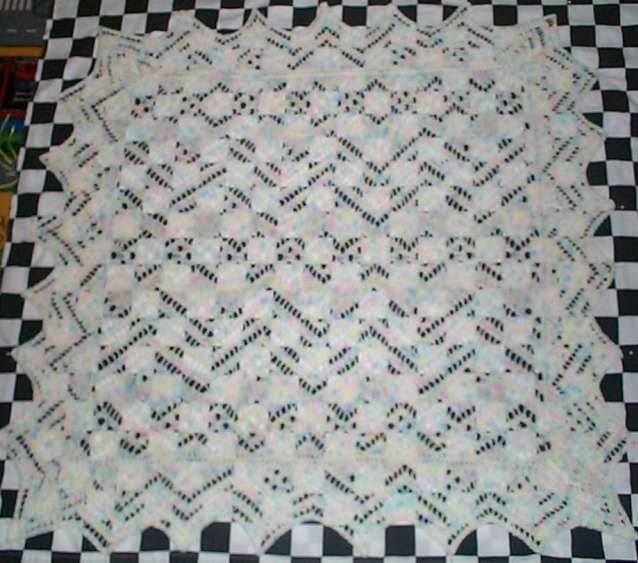 I also improvised a matching edging adapted from the main design’s zig-zag and quad eyelet motifs. 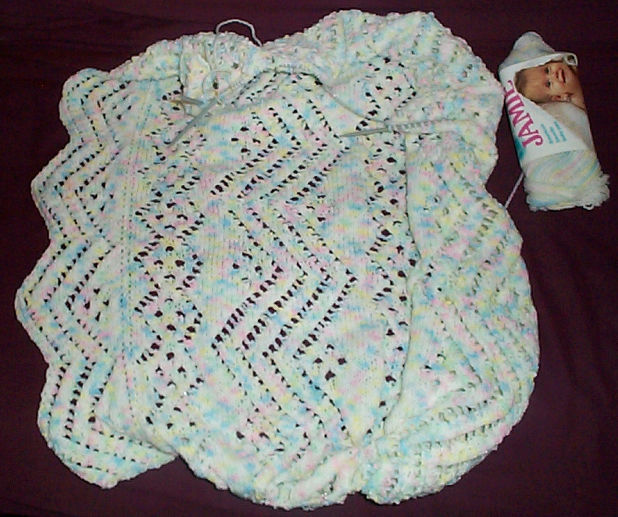 The thing is a square approximately 37 inches across from point tip to point tip – a useful size for a travel or basket blanket, although at tad small for a crib blanket. It’s knit in a DK weight yarn and sports a stockinette gauge of about 5.5 stitches per inch. Stitches used are knit, purl, K2tog, SSK, and YO. If you can manage them and read a chart, you can knit this thing. (While keeping place in the admittedly large chart can be a minor challenge, given sufficient sticky notes or magnetic bars, that problem is very manageable.) If anyone is interested in making one like this I’ll consider writing up and posting a pattern. One caveat – this piece is a gift and will be leaving the house within the next two weeks. Requests made after that time will have to rely entirely on my shaky memory. 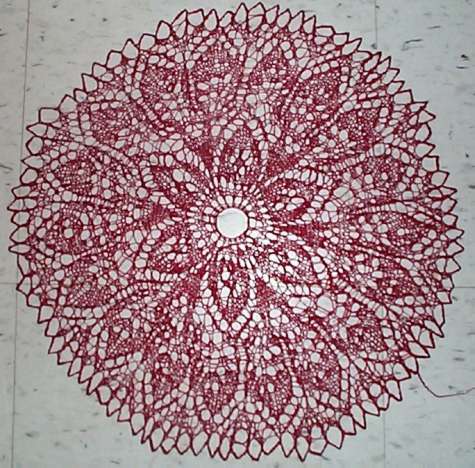 To embarrass myself, I went back through blog archives looking for when I knit this third red doily but didn’t find it. I think was knitting this piece back in the fall of 2006, and it has been sitting in the blocking pile ever since. 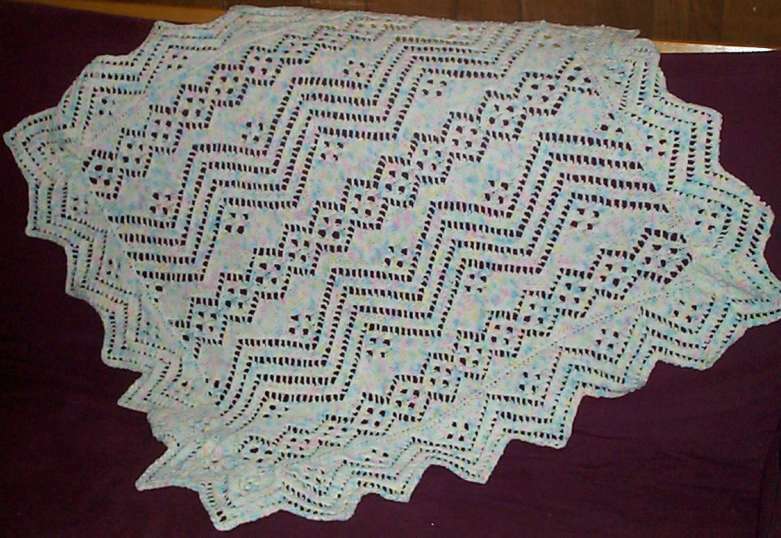 That’s so long ago, I’m not sure where the pattern is from, but I think it might have been from Patterns for the Art of Lace Knitting: The Complete Works of Rachel Schnelling, compiled by Gloria Penning. Still not much time for knitting around here, but I did get to finish off my doodle lace scarf (pix when I get a chance to block it), and do up a quick baby blanket.The blanket is still in process, but I’ll be posting more details of the finished pattern here if people are interested. I’m also still chugging away on the Kyoto for Elder Daughter. I’m about a third of the way through the sleeves. All that remains is to finish off the sleeves, piece the thing together and knit the collar strip. 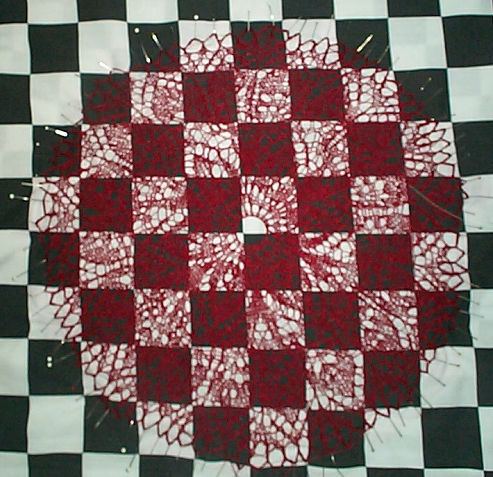 The picture shows the edging, plus one half of the blanket, from the edging to the line of lozenges that form the center. The big zig is mirrored on the other side of that center spine. It’s bundled up snood style because I’ve picked up stitches all the way around the perimeter, using two circs; and am now knitting the edging onto the body. I’d estimate this piece so far (center plus one side of the edging) has taken me about six actual hours of knitting time, spread over two weeks, which for a lacy blanket is pretty quick, even given my dismal work schedule. As to what I’ve knit this piece from – I’m not entirely happy with it. I’m working at consuming some of the yarn that I have here in the house. A dear friend of the family recently gave me a huge bag of mixed acrylics that she had accumulated from yard sales and flea markets. It included a number of skeins of 1993-vintage Lion Jamie Pompadour. It’s marked at 20 stitches and 28 rows = 4 inches or 10cm. I’m getting DK standard gauge of 5.5 stitches per inch in stockinette on US #7 needles. While it does knit up quickly, I’m not that pleased with the feel. It’s a Sayelle acrylic with a shiny rayon binder strand. The feel is rather spongy and a bit plastic like as opposed to woolly. The drape is relatively stiff given the yarn’s density and weight. Still, yardage per skein is high, it’s not itchy, it is machine washable, the color is pleasant if you like baby pastels, and having been stored well over the years none of the yarn is discolored, snagged, stained or smelly. I’ll probably use all of my inherited skeins for baby blankets for people I know might not have the time or inclination to hand-wash. For the record, the center of the blanket took a few yards more than three full skeins of Jamie- I’d estimate it as having eaten about 525 yards. The edging along one long side has taken a little over 3/4 of another skein. Final consumption figures will be forthcoming when I’m closer to the end.